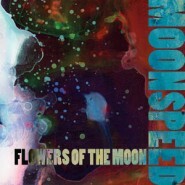 Eleven piece not-quite-ambi­ent, not-quite-dream­pop band Moon­speed released its most recent LP, Flow­ers of the Moon ear­li­er this month. As if an eleven-piece band weren’t enough, each mem­ber plays quite a few instru­ments, with the result being that there are near scores of avail­able instru­ments. And, of course, Jeff Suthers, the band’s founder, insures that each instru­ment is put to its full poten­tial, the most recent result being a quite promis­ing, though not entire­ly flaw­less album. Like many oth­er large-ensem­ble bands, Moon­speed strives for, and suc­ces­ful­ly cre­ates dreamy land­scapes of trance-induc­ing sound that remains nev­er­the­less well shaped. And while the extent to which Moon­speed suc­ceeds is impres­sive, what is more impres­sive is the diver­si­ty of ways with which this is accom­plished. And no less could real­ly be expect­ed from a band that, for exam­ple, lists two mem­bers as drum­mers and four (not entire­ly dis­tinct) mem­bers as per­cus­sion­ists. But lis­ten­ing to the suc­ces­sion of tracks on Flow­ers of the Moon is real­ly an impres­sive expe­ri­ence. The album opens with high­ly active yet unob­tru­sive per­cus­sion over­layed with lethar­gic synths from which slow­ly emerge strains of melody, gui­tars occa­sion­al­ly enter­ing most­ly for vari­a­tion. The track is fol­lowed, how­ev­er, by “Water’s Edge,” a high­ly acoustic, plod­ding­ly beau­ti­ful track that could eas­i­ly have stood to be a num­ber of min­utes longer. The third track then acts as some form of mid­dle ground between the pre­vi­ous tracks, while still man­ag­ing to sound com­plete­ly unique, and the album pro­ceeds from there. Moon­speed enlists three mem­bers of their eleven-mem­ber set for the vocal sec­tions of Flow­ers of the Moon, cre­at­ing well-com­posed (if sub­dued), atmos­pher­ic vocals. Moonspeed’s mem­bers seem quite hap­py to have their voic­es on a lev­el locat­ed below and around the main music, and as such they nev­er take cen­ter stage. Instead, they act as an engag­ing lay­er to the music, com­ple­men­tary to the melod­ic mix of the music. Nev­er­the­less, how­ev­er well this com­bi­na­tion works on cer­tain tracks, such as “Saw a Ghost,” where the echo­ing sound of the vocal line empha­sizes the busy sound of the track, in oth­er places it ends up over-sup­press­ing the vocals. Moonspeed’s mix of vocals is cer­tain­ly strong enough to recieve more promi­nence on Flow­ers of the Moon, and it’s unfor­tu­nate that it doesn’t. Though Moonspeed’s vocal line is gen­er­al­ly of the ethe­re­al, inten­tion­al­ly-dif­fi­cult-to-under­stand sort, occa­sion­al phras­es poke through, and the imagery they reveal cer­tain­ly helps to devel­op the music. In one exam­ple, the ques­tion­ing phrase “Where the riv­er bends / In your mind / At the water’s edge / What will you find?” on “Water’s Edge” evokes the sense of intro­spec­tion inher­ent to this sort of son­i­cal­ly rich music. Flow­ers of the Moon con­tains many of these short sec­tions, each of which (should you ful­ly under­stand them) helps to illu­mi­nate Moonspeed’s vision. What keeps Flow­ers of the Moon from being an excel­lent album though, is that it does lose some of its edge as it pro­gress­es. Tracks like “Magna-Save” are per­haps just a tad bit too exper­i­men­tal, and devolve into play­ing around with var­i­ous patch­es, throngs of unhelp­ful eccen­tric­i­ties, and over­stayed wel­comes. Still oth­er tracks are unin­ter­est­ing enough that, while not going to such an extreme as to be actu­al­ly irri­tat­ing, still don’t exact­ly help the album, and end up get­ting lost among the many oth­er, sig­nif­i­cant­ly more mem­o­rable tracks. With Flow­ers of the Moon, Moon­speed has clear­ly estab­lished itself as quite a for­mi­da­ble strength. Flow­ers of the Moon uses a com­bi­na­tion of airy vocals, elo­quent lyrics, and col­or­ful instru­men­tals to cre­ate an inter­est­ing, engag­ing whole. How­ev­er, it’s cer­tain­ly not with­out flaws - the vocals would ben­e­fit from being placed fur­ther for­ward occa­sion­al­ly, and the odd instru­men­tal mis­step is jar­ring among a gen­er­al­ly well-tuned musi­cal flow. Over­all, though, Flow­ers of the Moon is inven­tive, is large­ly enjoy­able, and above all, makes for a very inter­est­ing lis­ten.